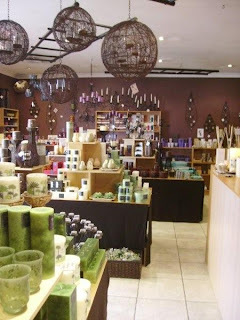 There is a beautiful shop in the Hunter Valley Gardens called Candelabra that sells candles of every shape, size and smell. It is a fabulous shop to wander around even if you don't need to buy anything. Today we spent a little while browsing and then I saw something I liked. A wall hanging made out of metal with four tea light holders in it. It was more reasonably priced than we were expecting so we bought it on impulse not quite knowing where it would go in our house. And here it is candles flickering on the wall in our kitchen. Do you want to join us for an atmospheric candlelit meal over the holidays?